It’s not easy to find the right styling tools for short hair. Straighteners are usually too wide and popular large barrel curling irons just aren’t going to cut it. If you’re looking for a curling iron for short hair, never fear. We researched some of the best brands and top rated products to put together this review so you can find the perfect styling tool for you. Here are some of the main things to consider when you shop. Material: Most of these products are made using a ceramic barrel which is one of the best materials out there. Not only does it create a style that holds, but it also leaves your curls smooth and shiny. Barrel Size: For short hair, smaller barrels are better because they give you a little more control over the style. These curling irons vary in size from 0.35 to 1.25 inches which still gives you a lot of variety. Highest Heat: Some of these products get pretty hot, as high as 450 degrees. If you have thick or very textured hair, you need a high temperature but something that hot isn’t necessary for thin, fine hair. Auto Shut-Off: If you’re someone who can’t always remember whether or not you turned off your curling iron before you left the house, automatic shut off is for you. The peace of mind it brings is worth it. Heat Settings: Most of our picks have adjustable heat settings. Some have 2 or 5 while others let you choose a specific temperature from 50 different options. Different hair textures require different temperatures so this is an important thing to consider. Warranty: These curling irons have a wide range of warranty coverage that ranges from no warranty to all to lifetime coverage. Most of them are covered for 1 to 3 years. As always, make sure you check your warranty information carefully. Now that you know a little bit more about what to look for, let’s take a closer look at our top ten picks. We put our top and budget picks first so you’ll be sure to see them if you’re in a hurry. That’s the best place to start so you can get a good idea about the range that’s out there. All of these products are really different, though, so stick around if you can. Alright, let’s get to it. Our pick for the best curling iron for short hair is the BaBylissPRO Nano Curling Iron. The small 1-inch barrel is perfect for shorter hair because it really lets you get a good grip while still being able to wrap the hair enough to get a perfect curl. The titanium and Sol-Gel ceramic technology create a barrel surface that’s 37% stronger and 22% smoother than standard curling irons, giving you get a smooth, sleek curl. 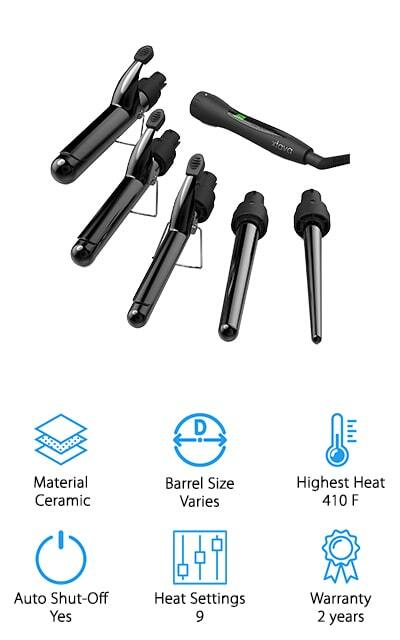 One of the great things about this styling tool is that there are 50 different heat settings and a maximum temperature of 450-degrees. That means you can choose the exact amount of heat that works for your hair texture for great results, every time. Plus, the 8-foot long tangle-free cord is convenient and allows for easy styling. If you’re looking for a spiral curling iron for short hair, our budget pick might be the one for you. 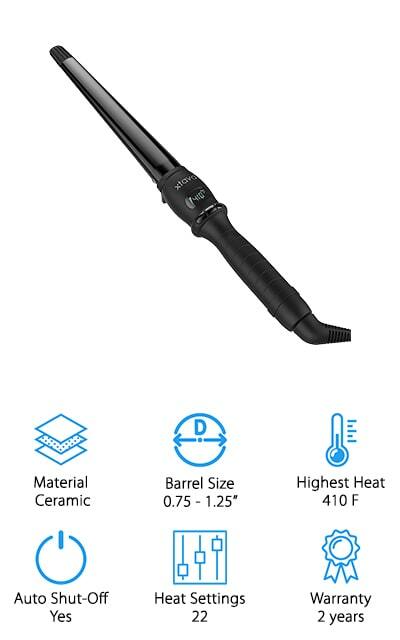 The Infiniti Pro Curling Iron has a conical barrel that tapers from 1 to 1 ½-inches so you have some versatility in how tight your curls will be. This is an easy-to-use modern design that doesn’t have a clamp, just wrap your hair around using your fingers for smooth, kink-free curls. The barrel is made of tourmaline ceramic which helps to reduce frizz and add shine to your hair. 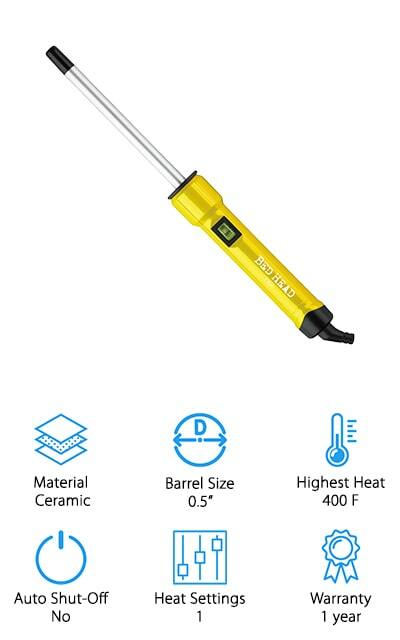 This styling tool heats up to a maximum temperature of 400 degrees F in only 30 seconds and features 5 different heat settings. There’s also an auto-off feature for safety and your own peace of mind. If you’re wondering about the best size curling iron for short hair, why not get one that gives you a lot of different options? The xtava 5 in 1 Curling Iron set comes with 5 changeable barrels, including 2 tapered barrels and 2 traditional clamped ones. These barrels do not have a cool tip in order to get the most possible curling surface so a heat-resistant glove is also included so you don’t have to worry about burning your fingertips. Each barrel is made with tourmaline ceramic to reduce static and frizz and give a shiny finish to your hair. There are 9 precise temperature settings that range between 250 and 410 degrees F as well as a digital LCD screen for precise adjustments as well as automatic shut off. The Bed Head Skinny Pop Curling Wand has a wrap and cool design with a cool tip to help eliminate any worries about burning your fingertips in the process. That said, they also include a heat protective glove, just in case. 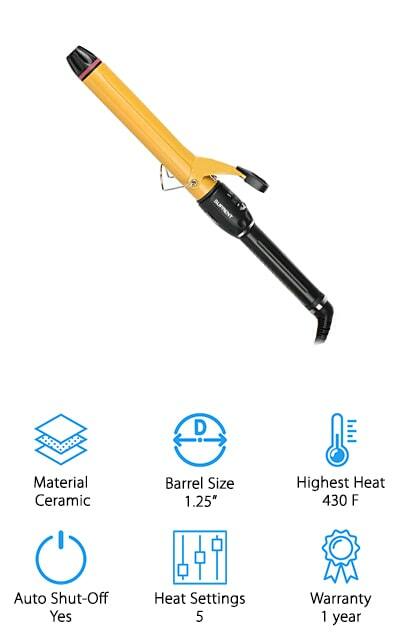 This curling iron only has one heat setting of 400 degrees F and the ½-inch barrel is perfect for creating ringlets or small curls. Plus, the tourmaline ceramic barrel helps reduce frizz and adds a lot of shine. It also has a convenient 5-foot long swivel cord that makes it really easy to position your curls in just the right spot. 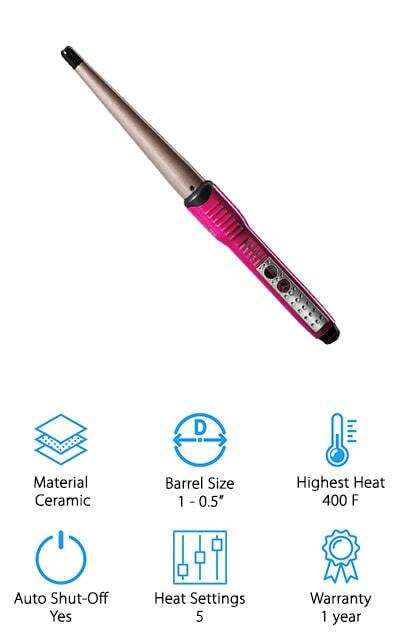 To set your mind at ease, this curling iron has an automatic shut off and is also covered by a 1-year warranty in case anything goes wrong. 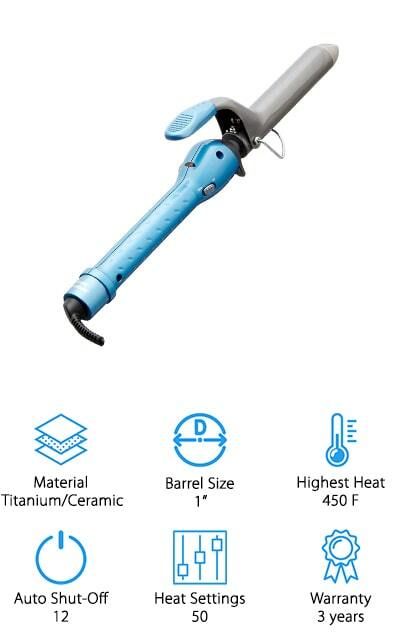 A good curling iron for short hair if you prefer one with a wand is the BLUETOP Small Barrel Curling Iron. At only 0.35-inch, this curling iron also has the smallest barrel size of all the products we researched. It heats up in minutes to the high-temperature setting of 446 degrees F for thick, coarse hair. There’s a low setting of 176 degrees F, too, which is perfect for thin, fine, soft hair that can’t tolerate such a high temperature. An anti-hot tip gives you something to hold on to when wrapping your hair around the wand so you don’t burn your fingers and the comfortable handle is wide and easy to control. The power cord is more than 8 feet long and swivels which make it really convenient to use anywhere. Le Angelique Curling Iron is our pick for the best wave curling iron for short hair. There’s no clamp, you don’t have to worry about kinks or creases. The single temperature setting of 450 degrees F uses a heavy duty heating element that is so reliable, it’s covered by a lifetime warranty. One of the most convenient things about this curling iron is the extra long 8-foot power cord. It’s tangle proof and swivels which makes it really easy to use anywhere. Although this one doesn’t have an automatic shut off, it does have a convenient on/off switch with an indicator light so you can easily see if its on or off. Since there’s no clamp, they include a heat-resistant glove so that you can style your hair without worrying about burning yourself. Another great choice is the Conair Double Ceramic Curling Iron. It has a ½-inch barrel and a clamp that makes it really easy to get a good hold on even really short hair. This is a great choice for making tight, long-lasting curls and it works with any hair texture. The maximum temperature is 375 degrees and there are 30 different settings so you can use the one that’s just right for your hair texture. That’s not all, there’s also a Turbo Boost button that delivers a boost of heat for extra hold. Because the ceramic surface is so smooth, it’s great at dispersing heat evenly which means fast styling and long-lasting curls. In fact, your style can last for as long as 18 hours and should even stay smooth in humid weather. The xtava It Curl Curling Wand is one of the top curling irons for short hair in part because of its versatility. This want ranges from 0.75 to 1.25 inches and has a unique oval shape for wide, loose curls for that just-rolled-out-of-bed look. 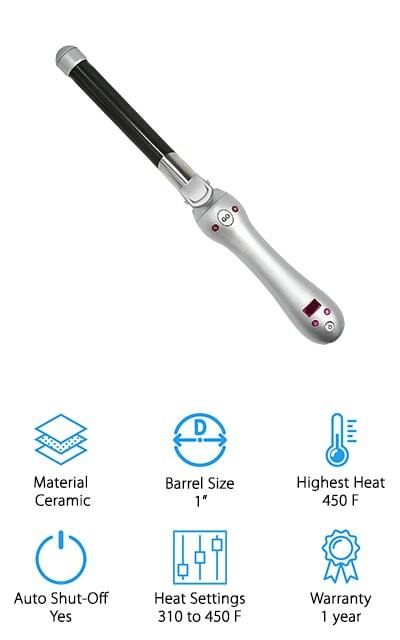 This wand quickly heats up to 410 F and has 22 different settings so you can choose the amount of heat that works best to give your hair the best style and the easy-to-read digital LCD display lets you see exactly what temperature it’s set to. It’s a good choice for color-treated or dry hair because the smooth ceramic tourmaline barrel adds smoothness and shine during styling. Automatic shut off kicks in after 60 minutes and the 8-foot long tangle-free cord is extremely convenient. Up next is the SUPRENT Hair Curling Iron. One of the cool things about this styling tool is the heat-sensing apron at the tip. The ring changes red to white as the temperature increases so you have an idea of how hot the barrel is just by looking at it. 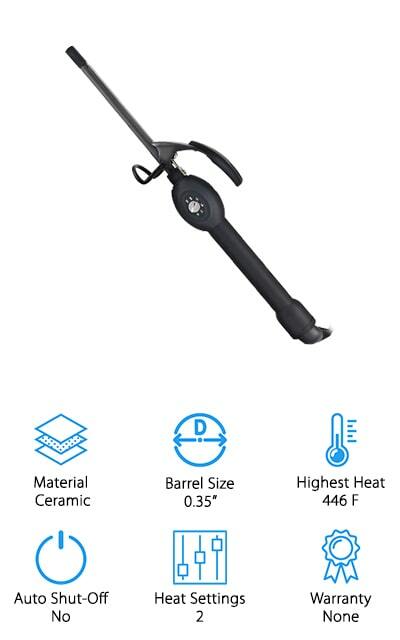 The temperature ranges from 270 to 430 degrees F and there are 5 different heat settings to choose from so whether you have fine, normal, or thick and textured hair, this curling iron will work for you. A 60-minute auto shut off sets your mind at ease if you can’t remember whether or not you turned it off when you left home and the 110/220v double voltage makes it a great choice for international travel. 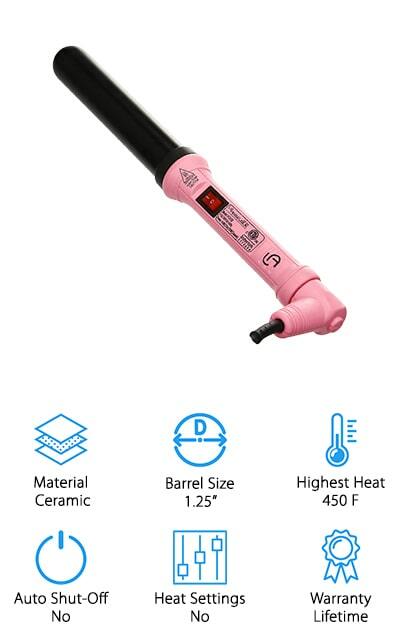 Maybe you thought you that an automatic curling iron for short hair was something you’d never find but, don’t worry, we found it for you. 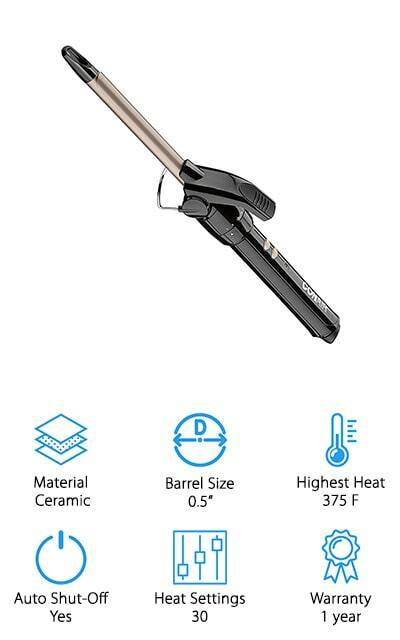 The Beachwaver Pro Curling Iron has a small, 1-inch barrel that’s perfect for shorter hair. Because the automatic styling rotates in both directions, you can really create some tousled, wavy styles. It heats up to between 310 and 450 degrees in only 30 seconds. You can choose any temperature in that range to get the right amount of heat for your hair texture. The ergonomic handle is easy to manipulate and comfortable to hold on to and the 360 swivel cord and rubberized cool safety stand make this a really convenient styling tool. Plus, it’s automatic which makes it the most convenient styling tool of all.